An elephant?! More of that later. First of all, spend a few minutes appreciating the revival that's gone on at Dumbarton FC over the past couple of months. A look at the Scottish First Division table might give the impression that 'revival' is a bit of an exaggeration. Dumbarton currently sit in ninth position, which is the play-off slot between the horror of automatic relegation in 10th, and safety in eighth. But it takes a different complexion upon realising it took them until the September holiday weekend to register their first point. Moreover, even after you'd wound your clocks back an hour in late October, Dumbarton had only managed to double that tally. Despite struggling to inspire the Sons in Division One, former manager Alan Adamson's sizeable contribution to their cause over the previous couple of years merits a mention. Having taken over in April 2011, he initially saved Dumbarton from relegation to Division Three before winning promotion to Division One last season. However, with the Sons struggling to stay afloat in a league they hadn't been in since 1995/96, Adamson was sacked. 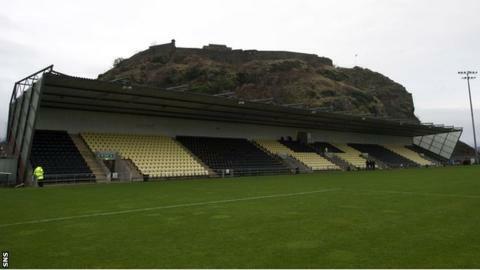 So, in the shadow of Dumbarton Castle, assistant manager Jack Ross held the fort at the Bet Butler Stadium until new player-boss Ian Murray was appointed late in November. "I applied for the job when I was in the States, just testing the water really to see what happened," Murray told BBC Scotland. "I was coaching kids, so it wasn't too relevant to what I'm doing now, but I just felt that any sort of coaching or speaking in front of people would help. "I don't know who applied for it or who got interviewed for it. "Perhaps being so young and just out the changing room myself gave me an edge because you know what's going on in a modern sense compared to a few others. "Maybe coming in and being able to play as well, if need be, was probably a big factor." A boyhood Hibs fan, Murray realised his dream by going on to play for and captain them during two stints. And in between those Easter Road spells he also spent time with Rangers and Norwich City. So why has the 'need not been' to play himself for Dumbarton yet? "It's not been necessary up until now, and because of lack of games to be perfectly honest," explained Murray. "If you look over the last 14 months, I've only played three competitive games. So in terms of being up to speed to play First Division football at the moment, I don't feel as if I'd be doing the team or myself any favours." Murray's six league wins have come against many of the high-flyers in Division One this term, including Livingston, Morton and Partick Thistle. The 31-year-old cites the challenge of winning games as a manager as something which has given him renewed enthusiasm for the game. And, in addition to the tactical side, Murray has implemented a few ideas of his own, including bringing in former Scotland international goalkeeper Craig Gordon as a coach. "I just felt organisationally they weren't quite up at First Division standard," he said. "We knew we had decent players, it was just about organising them correctly - making them believe they had the ability to go and compete. "Just little things. We do pre-match meals now on a home game so we know the players are eating at least one good meal before they play a game. "We also do recovery stuff which we didn't do before. "Being part-time, we're just trying to bridge the gap as much as we can with the full-time teams. "You can't look after players 24/7 at full-time level, never mind at part-time. "Even if those things just give us an extra one or two per cent, it's better than zero." And so to the elephant in the room - quite literally. How many of you had noticed Dumbarton's club crest features one of those likeable, large, noisy mammals? More to the point - had Murray? "I think it's something to do with the Dumbarton Rock actually," he began, slowly. "I'm not too sure why, but I read somewhere not too long ago that it's something to do with the Rock. "We obviously play under the Rock….oh that's it, the Rock's meant to look like an elephant! "It's funny, it was my wife that was asking me that and she checked it for me. "The mascot's an elephant as well so it must have some significance!" Just when Murray couldn't get any more popular with Dumbarton fans, or "Sons of the Rock" to give them their Sunday name, he even goes and explains the elephant thing, too.